Getting a dream backyard—not to mention maintaining it—takes a lot of work. If your space is looking a little unloved, consider these do-it-yourself upgrades that will have you enjoying your outdoor space in no time. 1. CONSTRUCT KEYHOLE GARDEN SPACES. Permaculture expert Matt Powers recommends adding keyhole gardens to your backyard for both visual appeal and space-saving planting. These C- or U-shaped beds provide enough room for gardeners to stand or pivot while working, along with easy access from both sides. Keyhole gardens are easy to modify based on personal needs and your backyard vision, and this permaculture practice is an easy way to incorporate gardening for beginning green thumbs. 2. GIVE YOUR DIRTY DECK A FACELIFT. Decks often take on a gray, grungy look as they age, making your entire backyard look frumpy. But with some elbow grease and a household cleaner, it’s possible to shave a few years off a wooden deck’s appearance without a power washer (which can often be too rough on wooden surfaces). This Old House host Kevin O’Connor recommends scrubbing wooden decks with oxygenated bleach and a soft brush to remove mildew and dirt. Follow a good cleaning with sanding and a new coat of protective stain. O’Connor suggests tackling deck cleaning during the springtime to avoid the further stress on wooden decks that’s often experienced by hot summer days. A backyard with no shade can make summertime miserable. Ditch the basic patio umbrella for fast-growing trees (like willows, poplars, or soft-wooded maples) that provide natural shade. Selecting the perfect tree for your green space (and knowing how to care for it) can be overwhelming, so make the task easier with the Arbor Day Foundation’s tree wizard. This digital tool narrows in on the best saplings for your backyard based on climate, growth rate, and size. 4. END RAINY DAY SOGGINESS WITH SWALES. If your outdoor space resembles more of a lake than a yard following a heavy rain, constructing a swale can help. Swales—shallow trenches that help slow and soak up excess water—can be used to redirect water for gardening or to simply avoid flooding. While this form of earthwork has a purpose, it doesn’t have to look like bare dirt. Permaculture author Amy Stross suggests using swales as borders for raised beds or filling with gravel for visually appealing pathways. 5. REPAIR AND REVAMP OUTDOOR FURNITURE. Patio sets and lounge chairs aren’t cheap to replace, so consider giving new life to what you already have. Metal furniture can easily be wire-brushed clean of flaking paint and coatings while rust removers can finish off prep work. Several coats of primer and paint in a trendy color can give your entire patio set a new look. Older wicker furniture can also get a second chance thanks to some basic care. Furniture restoration expert Cathryn Peters suggests bringing natural fiber furniture indoors at night and in inclement weather to prolong its life. For older, worn pieces, freshen with a turpentine and boiled linseed oil mix before re-staining with an oil-based varnish, shellac, or lacquer. 6. DITCH THE SOD FOR FOOD. Instead of begrudgingly mowing grass all summer, scrap your back lawn for greenery that gives maximum returns. Activist and author Heather Jo Flores suggests ditching backyard greenery altogether for homegrown foods in Food Not Lawns. By starting with small patches of yard and working up to larger areas (or the entire space), it’s possible to grow hundreds of pounds of produce per year without being overwhelmed by garden work. And if there’s no grass to dig, Flores recommends gardening in containers or using vertical spaces along fences and your home. 7. STAIN A CONCRETE PATIO FOR A POLISHED LOOK. Concrete patios can get a facelift, too. Many homeowners settle for the standard (and affordable) gray concrete look, but adding a stain or pattern can personalize your patio space on the cheap. With this two-day project, it’s easy to replicate the look of bricks or stones without the cost—or the dreadful task of keeping grout clean and weed-free. 8. GROW A NATURAL PRIVACY FENCE. 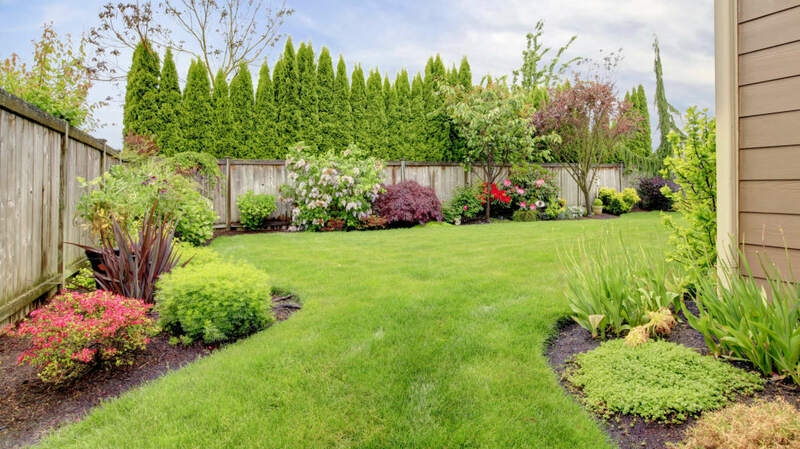 Natural fences can help your green space feel secluded (even in a busy neighborhood), but know upfront that this form of fencing isn’t an instant fix, considering they can take years to grow in. Landscape designer Sandra Jonas says natural fences can keep intruders and wildlife out of your yard, especially bushes with thorns or rough leaves. While there are countless ways to design a natural fence, Jonas warns against planting bamboo because of its eagerness to spread—leading to a lot more outdoor work. 9. USE MIRROR TRICKS TO INCREASE THE SIZE YOUR YARD. Mirrors have long been used indoors as room-lengthening décor pieces, but you can also take this trick outside to increase the size of your yard without having to purchase more space. Tuck mirrors into planters, along fences, and as large yard decor to reflect light and give the illusion of a larger space. Choose mirrors that can withstand outdoor weather and temperature changes, and avoid placing them in areas birds frequent to prevent collisions. 10. REGENERATE BALDING LAWN SPOTS. Spring is the best time to weed out grass problems for a lush lawn, including unsightly bald spots. You may see dead spots in areas where pets urinate or children play frequently, or in spots where too much or too little water is an issue. The Royal Horticultural Society suggests cutting out dead patches of grass and lightly aerating before sprinkling new grass seed or applying turf. Matching up the seed or turf variety with your existing grass can help this repair blend for a seamless look. 11. ADD A SIMPLE (AND RELAXING) WATER ELEMENT. Adding a fountain or pond to your backyard can seem intimidating, but it doesn’t have to be. According to HGTV’s Chris Lambton, most water features have the same basic pieces—a liner, a pump, and an electrical source—making them fairly easy (and inexpensive) to install yourself. Whether you choose an earthy vibe or a modern concrete design, a water feature can elevate your backyard’s relaxation factor and act as a mini stress reliever. And, after all, isn't that one of the main reasons to have a pretty, well-maintained outdoor space?